Q – OK Leslie, let’s start chatting about you. Tell the world what got you into real estate in the first place? L – So there I was, in Los Angeles, in the early eighties. Not the best time to be buying real estate, mind you, but I did it – bought my first home and survived the process even though I wasn’t really sure what was going on. A few years later I realized I wanted to be the person helping those who didn’t know what to do – after all this is usually someone’s largest investment and I love that I can be a part of it all. Q – That’s right, you’re a California girl. So how does a California girl end up at Quinn & Wilson? L – I always admired the fact that the company didn’t give in to the pressure to become a big national brand. When I was looking for a place to be, I saw that most of the people had 10, 15, 20 years experience – and I knew that was a testament to the support they received; it matched the way I feel about supporting my clients. Q – So, now we find out more about you. If you could sell a house to anyone, who would it be? L – Bradley Cooper! You know he’s a local guy, right? I remember I actually sent him a note once; he would be fun to drive around and sell a house to. Q – Good one…hopefully you will get a note back someday. What are three things that you would say most people don’t know about you? L – So the first one is that my mother, my father and I all have the same birthday (August 21st). It made for interesting times when I was younger. Second, my son was born at only 3 1/2 pounds – so nurturing isn’t just something I do at work, he is now an amazing guy. The final one is the one that surprises most people…I’m actually really shy when I first meet people. Q – C’mon, really? You don’t seem that way, but then again we’ve all known you for years. Do you have a favorite architectural style? Q – Great. How about in the community – what things do you do to stay involved? L – I live in Glenside and there is always something going on. I am a volunteer for the Abington/Jefferson Hospital Auxiliary. I also support the LaSalle High School Crew team where my son rowed when he was in High School. I also support many local fundraisers. I prefer to give back to families in need from the community. Q – Those are all worthy groups and they certainly benefit from your involvement. So, on a more personal note, what do you think is the one thing you can’t start your day without? L – A short meditation time. Just a chance to clear my mind and get focused for the day ahead. If I don’t have it, the day just doesn’t feel the same. Q – That’s cool. Now during that meditation maybe you have considered this one…if you were stranded on a desert island, what are the three things you would want to have with you? L – Well, that’s not part of my mediation, but I would say my family, my friends…and an ever-lasting supply of matches. Q – OK, that had better be a pretty big island…we have seen some of your friend gatherings and it goes without saying you have a great social circle. Looking at the real estate business, what is your number one tip for buyers and sellers? L – Pick the right agent. Like I said earlier, I started this because I really didn’t feel like I knew what was going on in that first sale. You need someone you feel comfortable with, someone who is going to give you the info that you need, someone who at the end of the day you are going to feel really helped you. 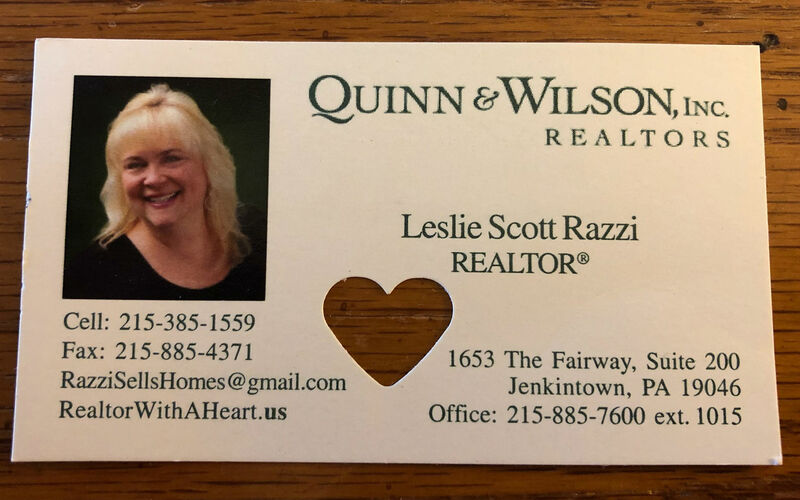 Q – You mean a #RealtorWithAHeart, right? In addition to that advice, what would you say is the number one misconception people have about real estate? L – Oh, that’s easy. People always think because I’m in real estate I can make my own hours. But sometimes this is a business where the schedule drives you, not vice-versa. Q – Great point. OK, last one for you…what’s Leslie Razzi’s favorite night out? L – Marco Polo in Elkins Park. I cook most nights at home, so when I go out I want really good food that I wouldn’t make. It’s a local place with an excellent menu. The good thing is that we often run into people we know there, so it is social as well.